An example of adenoviral gene therapy in the human diabetic organ-cultured corneas is presented towards the normalization of delayed wound healing and markedly reduced epithelial stem cell marker expression in these corneas. It also describes the optimization of this process in stem cell-enriched limbal epithelial cultures. Kramerov, A. A., Saghizadeh, M., Ljubimov, A. V. Adenoviral Gene Therapy for Diabetic Keratopathy: Effects on Wound Healing and Stem Cell Marker Expression in Human Organ-cultured Corneas and Limbal Epithelial Cells. J. Vis. Exp. (110), e54058, doi:10.3791/54058 (2016). The goal of this protocol is to describe molecular alterations in human diabetic corneas and demonstrate how they can be alleviated by adenoviral gene therapy in organ-cultured corneas. The diabetic corneal disease is a complication of diabetes with frequent abnormalities of corneal nerves and epithelial wound healing. We have also documented significantly altered expression of several putative epithelial stem cell markers in human diabetic corneas. To alleviate these changes, adenoviral gene therapy was successfully implemented using the upregulation of c-met proto-oncogene expression and/or the downregulation of proteinases matrix metalloproteinase-10 (MMP-10) and cathepsin F. This therapy accelerated wound healing in diabetic corneas even when only the limbal stem cell compartment was transduced. The best results were obtained with combined treatment. For possible patient transplantation of normalized stem cells, an example is also presented of the optimization of gene transduction in stem cell-enriched cultures using polycationic enhancers. This approach may be useful not only for the selected genes but also for the other mediators of corneal epithelial wound healing and stem cell function. The diabetic corneal disease mainly results in degenerative epithelial (keratopathy) and nerve (neuropathy) changes. It is often manifested by the abnormalities of epithelial wound healing and corneal nerve reduction1-4. An estimated 60-70% diabetics have various corneal problems1,3. Our studies have identified several marker proteins with altered expression in human diabetic corneas including the downregulation of c-met proto-oncogene (hepatocyte growth factor receptor) and the upregulation of matrix metalloproteinase-10 (MMP-10) and cathepsin F5, 6. We have also documented significantly decreased expression of several putative epithelial stem cell markers in the human diabetic corneas. In the previous studies we have developed an adenoviral-based gene therapy to normalize the levels of diabetes-altered markers using human diabetic corneal organ culture system, which shows slow wound healing, diabetic marker changes, and stem cell marker expression reduction similar to the ex vivo corneas7,8. This persistence of changes appears to be due to the existence of epigenetic metabolic memory9. This culture system was further used for gene therapy. The targets for this therapy were chosen from markers with either reduced expression in diabetic corneas (c-met proto-oncogene), or increased expression (MMP-10 and cathepsin F). The adenoviral (AV) therapy was used in the whole organ-cultured corneas or the corneoscleral peripheral limbal compartment only. This compartment harbors epithelial stem cells that renew the corneal epithelium and actively participate in the wound healing4,10-15. Here, protocols are provided for normal and diabetic human corneal organ culture, epithelial wound healing, isolation and characterization of stem cell-enriched limbal cell cultures, and adenoviral cell and corneal transduction. Our results show the feasibility of this therapy for normalizing marker expression and wound healing in diabetic corneas for possible future transplantation. They also suggest that the combination therapy is the most efficacious way to restore normal marker pattern and epithelial healing in the diabetic cornea16-18. National Disease Research Interchange (NDRI, Philadelphia, PA) supplied consented post-mortem healthy and diabetic human eyes and corneas. NDRI's human tissue collection protocol is approved by the managerial committee and subject to National Institutes of Health oversight. This research has been conducted under the approved Cedars-Sinai Medical Center Institutional Review Board (IRB) exempt protocol EX-1055. Collaborating corneal surgeons, Drs. E. Maguen and Y. Rabinowitz, supplied discard corneoscleral rims for isolation of stem cell-enriched corneal epithelial cultures. This research has been conducted under the approved IRB protocol Pro00019393. Note: Normal and diabetic corneas or whole eyes are received in chilled corneal storage medium (e.g., Optisol GS) within 48 hr after death from the national supplier NDRI. Remove the corneas from storage container with forceps and wash them twice in the antibiotic-antimycotic (ABAM) mixture. In case of whole eyes, cut the corneas out from the globes with curved scissors. Leave at least a 5 mm conjunctival rim and also wash the corneas in ABAM. Prepare the mixture to be placed in the corneal concavity. It consists of serum-free minimum essential medium (MEM) containing ABAM, 1 mg/ml calf skin collagen (made from a stock solution of 10 mg/ml in 0.1 N acetic acid), 1% agar, and insulin-transferrin-selenite supplement7. Microwave this mixture to boiling for sterilization and agar dissolution. It may take up to 1 min for everything to dissolve. Leave the tube cap partially open because the mixture overflows easily when it boils. For this reason, several boiling cycles may be needed, each for 10-15 sec. Cool down the mixture to 37-39 °C. Place the corneas epithelial side down in sterile 60 mm dishes. Fill the corneal concavity with approximately 0.5 ml of the mixture described in 1.2. The mixture solidifies on the corneas within 2 min. Place the corneas agar side down in sterile 60-mm dishes and add the full medium containing MEM with ABAM, and insulin-transferrin-selenite supplement7 (37 °C) to keep its level approximately at the limbus for air-liquid interface culture. The medium volume is 7-8 ml per dish. Place the dishes with the corneas into a 5% CO2 incubator humidified with a water pan (this way, humidity level is kept at or above 95%) at 35 °C (normal corneal temperature). Add 100 μl medium (two drops) daily on the epithelium to moisten the corneas. Monitor the corneal morphology and the epithelial cell viability microscopically under transmitted light using a standard microscope with a 4X objective. Do so once a day. Change the medium every three days. The corneas can be cultured for at least three weeks. For the gene therapy experiments, culture the corneas for 3-5 days, then transduce with genes of interest (4.1-4.4), leave for another 3-5 days depending on the transgene and subject to the wound healing protocol (2.1-2.4). Note: In the diabetic corneas, the epithelial debridement by mechanical scraping is not feasible because the fragile epithelial basement membrane is detached in the process, which does not happen in the normal corneas. Thus, to keep the normal and diabetic corneas under similar conditions of wound healing, chemical removal of the epithelium with n-heptanol is used19. This procedure removes the epithelium but leaves behind an intact basement membrane in both the normal and diabetic corneas. To perform central epithelial debridement20, place a 5 mm filter paper disc soaked in n-heptanol on the central corneal anterior surface for 75 sec. Remove the filter and wash the corneas in full medium. Fill the concavity with 0.5 ml agar-collagen mixture and culture as in 1.4. After debridement, the epithelial cells usually die and slough off leaving behind microscopically intact basement membrane7. Use 8.5 mm disks to create larger epithelial wounds in the experiments with only limbal gene therapy. This will ensure the involvement of limbal stem cells in the healing process. Monitor the corneal healing microscopically. Make photographs at 4X and 10X every day until the epithelial defect is completely healed. The healing process can take from 2 to 15 days depending on the state (normal or diabetic) and wound size. Note: During the healing process, black spider-like cells are observed at the top focal plane. These cells are apoptotic stromal keratocytes that died after the epithelial removal4. The healing is determined to be complete when these dead cells are overgrown by the healing epithelium and are no longer visible (Figure 2, inset). After healing completion, cut the corneas in half, embed them in O.C.T. compound and process for indirect immunofluorescence on cryostat sections or for Western blots16,21. Note: Prepare the primary limbal epithelial stem cell (LESC)-enriched cultures from the corneoscleral rims. The rims coming from healthy donors and discarded after corneal transplantations are received from the collaborating surgeons in the standard corneal storage medium (e.g., Optisol). Otherwise, the LESC-enriched cultures can be obtained from the rims excised from normal and diabetic whole corneas or globes received from NDRI in the corneal storage medium. If the whole corneas or globes are used, first isolate the limbal areas. To do this, place the cornea on a sterile plastic dish with epithelial side up and remove the central area with a 9-mm trephine (circular corneal knife). Discard this central part. Then excise the limbal zone using a 13 mm trephine and discard the outer conjunctival part. To isolate cells use the bagel-like limbal rim. Before cell isolation, remove the endothelial cells and adhering remnants of the iris from the inner side of the cornea opposite to the surface epithelium with a sterile cotton swab. Isolate limbal cell sheets using dispase treatment. Incubate each corneoscleral rim with 2.4 U/ml dispase II in 1.5 ml keratinocyte serum-free medium (KSFM) supplemented with 10% fetal bovine serum (FBS) at 37 °C for 2 hr22. Gently ease the limbal epithelial cell sheet off the rim under a dissecting stereo microscope with a forceps and dissociate the cells in 1 ml of 0.25% trypsin - 0.02% EDTA solution for 30 min at room temperature. Wash the cells in 10 ml of medium (e.g., Epilife) and pellet them at 300 x g in a table-top centrifuge for 5 min at room temperature. Resuspend the cells in culture medium: medium with N2, B27 and human keratinocyte growth supplements, and 10 ng/ml epidermal growth factor (EGF). Seed the cells at 3,000-5,000 cells/ml in flasks or 60 mm dishes coated with a mixture of human basement membrane proteins including fibronectin, type IV collagen, and laminin (FCL), at 0.5-1 μg/cm2, in the KSFM medium. Culture the cells in a humidified (95% or higher humidity) CO2 incubator at 37 °C until they form fully confluent monolayers. This may take 1-2 weeks. Note: Regularly confirm the cell identity by positive immunocytochemical staining for putative LESC markers including PAX6, keratin (K) 14, K15, K17, and ΔNp63α. The staining details including the primary antibodies have been published8,16-18,22. To passage the confluent cells, treat them with 1 ml 0.05% trypsin solution (1:5 dilution of the 0.25% solution) for 10 min at 37 °C. Add 5 ml soybean trypsin inhibitor solution (10 mg/ml) diluted 1:4 in medium, and centrifuge the cells as in 3.5. Wash the cell pellet in 3 ml of diluted soybean trypsin inhibitor solution. Plate the cells onto FCL-coated (see 3.7) dishes or glass chamber slides at 2 x 104 cells/ml. Note: The recombinant adenoviruses (AV) include AV-vector (no gene inserted), AV-cmet (with the c-met gene open reading frame), AV-shM10 (with shRNA to MMP-10), and AV-shCF (with shRNA to cathepsin F). They are E1/E3-deleted type 5 AV expressing genes under the control of the major immediate early cytomegalovirus promoter. The AV-cmet viruses are generated using AV vector pAd/CMV/V5-DEST16. The AV-shRNA viruses are custom generated by subcloning of shRNA sequences along with hH1 promoter and GFP tag sequence from iLenti-EGFP vector into a replication-incompetent (-E1/-E3) human AV type 5 genome using Adeno-4 expression system17. Transduce one organ-cultured cornea of each pair with AV-vector and another cornea, with a gene expression-modulating AV. Use the AV-cmet at 0.8 to 1.25 x 108 plaque-forming units (pfu) per cornea in culture medium for 48 hr at 37 °C keeping the corneas under the medium surface each in a well of a 24-well dish. Use the AV-shRNA viruses at 1-2 x 108 pfu per cornea. Use the viruses for transduction in full medium supplemented with 75 μg/ml sildenafil citrate. This reagent activates the caveolin transport facilitating viral uptake by the epithelial cells21. Due to short half-life of sildenafil in aqueous solutions, re-add the same amount to the medium 4-5 hr later. Standard treatment is for 48 hr. Transfer corneas to new dishes with a round end sterile spatula and culture in the medium without AV keeping the medium level at the limbus. After the additional 4-8 days at the liquid-air interface, process the AV-treated corneas for various analyses or test for epithelial wound healing (see above). Routinely moisten the corneas during culture by adding 100 μl medium (two drops) on top of the cornea. For the transduction of the limbal cells only, incubate the viruses with the corneas at the air-liquid interface with medium level at the limbus, to avoid transduction of the central epithelium. Maintain the LESC-enriched cultures in the medium with 10 ng/ml EGF (see 3.5) on plastic dishes coated with the FCL mixture at 0.5 μg/cm2. Transduce cultured cells that have reached 70-80% confluency with the AV harboring the green fluorescent protein gene (AV-GFP) or the AV-scrambled shRNA-GFP in a range of multiplicity of infection (MOI: 1-300 pfu/cell), in the medium with 2 ng/ml EGF. Perform the transduction for 4 hr at 37 °C in a minimal volume (0.2 ml) followed by 20 hr in 0.5 ml medium. The caveolin transport activator sildenafil is not needed for the cell culture transduction. Use one of the following reagents that facilitate the AV binding to the cell surface to enhance the AV transduction efficiency: either polycations (1 μg/ml poly-L-lysine or 5 μg/ml polybrene), or 6 μl/ml transduction reagent (e.g., ViraDuctin), or 20 μl/ml transduction enhancer (e.g., ibiBoost). After replacing the medium for the one without the AV, incubate cultured cells for 4 days, in the humidified CO2 incubator and evaluate GFP expression level using an inverted fluorescent microscope. Use the scratch wound healing assay to evaluate cell migration in the AV-transduced cultures. Grow the cells in the multiwell chamber slides. Make the wounds in a monolayer by scratching cells in a straight linear motion with a 200 μl pipette tip. After wounding, change the medium for a fresh one to remove the detached cells. Photograph the wounds every day with a digital camera attached to an inverted microscope at 4X magnification. Record the time when the healing is complete (the wound edges come into contact along the entire wound). We have shown previously that in the corneal organ cultures, the differences in the expression of diabetic markers (e.g., basement membrane proteins and integrin α3β1) and wound healing between the normal and diabetic corneas are preserved. This culture system was subjected to the gene therapy aimed at normalizing the levels of diabetes-altered markers, c-met, MMP-10, and cathepsin F.
When the whole corneal epithelium was transduced with the AV-cmet, or AV-shRNA to MMP-10 or cathepsin F (separately or in combination), the epithelial wound healing was completed significantly faster (P<0.03 by paired Student t test compared to AV-vector) than in the AV-vector-transduced fellow corneas from the same donors16,17. The AV-cmet reduced the healing time by half, which did not significantly differ from healing of the normal corneas (Figure 1). The AV-shM10 and AV-shCF had smaller effect. However, a combination of the AV-cmet with the AV-shM10 and AV-shCF (Combo) produced the strongest effect completely normalizing the epithelial healing times (Figure 1). This reduction in healing time was accompanied by the normalized patterns of diabetic (basement membrane and integrin) and stem cell markers in the diabetic corneas8,16,17. The epithelial stem cells are the major wound healing participants4. Therefore, we examined whether limbal gene therapy targeting the stem cell compartment would be beneficial for the diabetic corneas. To this end, only the limbal parts of the diabetic corneas were transduced by the AV-cmet or Combo and large, 8.5 mm wounds were created. The AV-cmet transduced corneas healed significantly faster (P <0.001 by paired Student t test) than the AV-vector transduced fellow corneas (Figure 2). The Combo treatment resulted in the same outcome18. Gene therapy increased the expression of diabetes-suppressed markers, such as integrin α3β1 and basement membrane component nidogen-1 (Figure 3, left columns, Combo). Importantly, as in the whole corneal transduction8,17, the limbal gene therapy with either the AV-cmet or Combo led to a markedly increased expression of putative LESC markers including K15 and ΔNp63α, compared to the AV-vector transduced corneas (Figure 3, right columns, both c-met and Combo). These data supported the role of stem cell normalization in the accelerated wound healing upon gene therapy of diabetic corneas and show the feasibility of our approach to the treatment of diabetic corneal disease. We next started to examine the gene therapy effects on cultured LESC-enriched limbal epithelial cells. The cultures of normal and diabetic limbal epithelial cells were established and stained for putative LESC markers. Many cells stained positive (Figure 4). 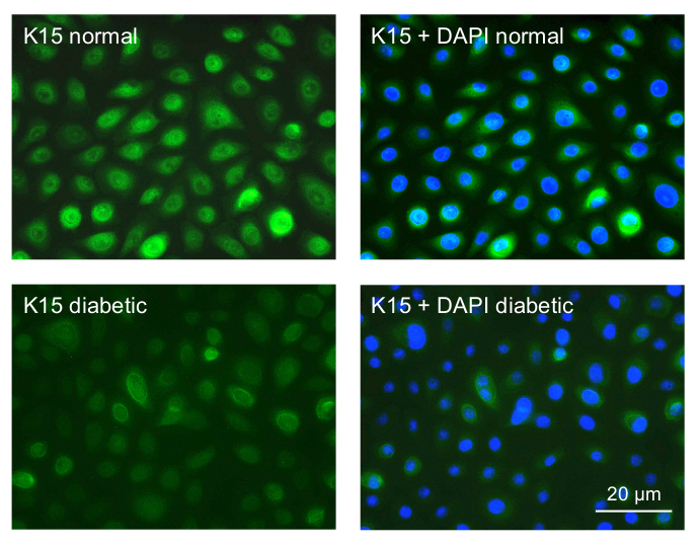 The staining intensity in the diabetic cultures was consistently weaker than in the normal cultures (K15 shown as an example in Figure 4), which was very similar to the situation in the diabetic vs. normal ex vivo corneas8. These experiments validated the obtained cell cultures as suitable for the gene therapy. Preliminary experiments with a telomerase-immortalized corneal epithelial cell line (see23) showed that the cells were easily transduced by the available AV constructs (data not shown here). However, the primary limbal cultures proved to be much more sensitive to the viral load and/or the transduction reagent, necessitating optimization of the transduction protocol. The cultured limbal cell transduction by the AV-GFP (Figure 5) depended upon the multiplicity of infection (MOI; range 30-300 pfu/cell) resulting in a fairly high level of transduction at high MOI (GFP expression in >80% cells). However, the higher MOI were also toxic, causing cell death or severely impaired cell migration into the scratch wounds after 3-4 days of transduction (Figure 6). At the lower MOI (10-30 pfu/cell), the AV transduction produced less or no cytotoxic effect, but resulted in a decreased number of GFP-expressing cells (5-15%). We next attempted to boost the transduction efficiency without compromising cell viability by using transduction-enhancing reagents that generally facilitate the AV binding to the cell surface. They showed different efficiency improvements in limbal epithelial cell transduction by the AV at MOI 10-30. 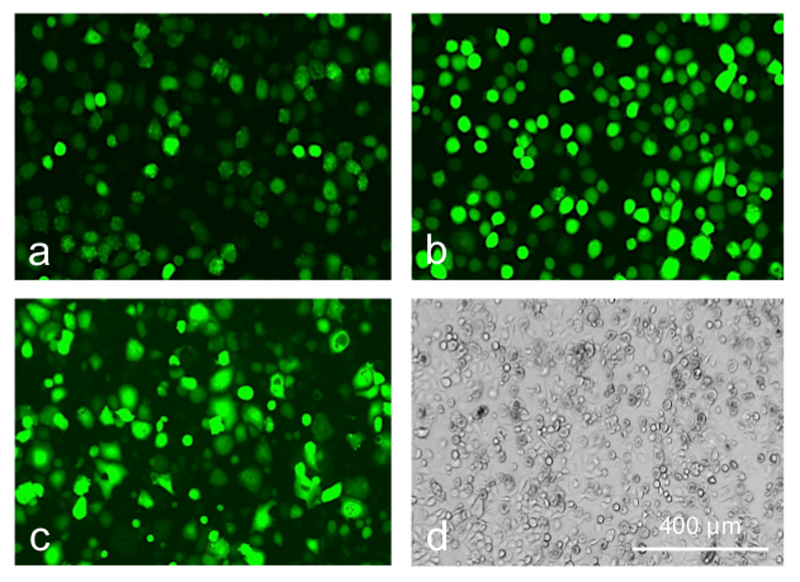 Both polycations, poly-L-lysine, and polybrene, were non-toxic and the most effective resulting in 3-4 fold increase in the number of GFP-positive cells (Figure 7, top row). ibiBoost was also effective but slightly toxic, and ViraDuctin was ineffective and rather toxic (Figure 7, bottom row). Therefore, polycations offer safe and efficient way to boost gene of interest expression upon the AV transduction and should be used for the gene expression and wound healing experiments. 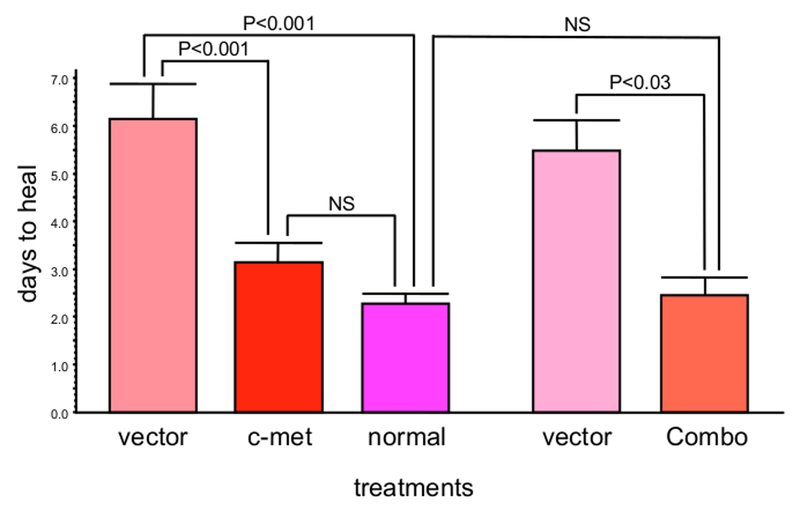 Figure 1: c-Met gene transduction leads to significantly decreased corneal epithelial wound healing time (mean ± SEM). Moreover, combined gene therapy (Combo) with AV harboring c-met gene and shRNAs to MMP-10 and cathepsin F genes completely normalizes epithelial wound healing time. Significance (p values) was established by paired Student t test in comparison with respective vector treatments. Bars represent the standard error of mean. Please click here to view a larger version of this figure. Figure 2: Healing of 8.5 mm epithelial wounds in a pair of diabetic corneas. Top row, vector-transduced cornea; healing is complete in 8 days. Bottom row, AV-cmet transduced fellow cornea; healing is complete in 5 days. Arrows show wound (W) edge. *, non-healed part (also shown at high magnification as inset), with the spider-shaped apoptosed stromal keratocytes. They are visible until the epithelial layer grows on top of them. Bar = 50 μm. Phase contrast. Please click here to view a larger version of this figure. Figure 3: Immunostaining of diabetic corneal sections for various markers after limbal gene therapy. Both AV-cmet and Combo treatments result in markedly increased limbal staining for diabetic markers (integrin α3β1 and nidogen-1) and putative stem cell markers (K15 and ΔNp63α). Arrows on nidogen-1 panels mark corneal epithelial basement membrane. Bar = 30 μm. e, epithelium; s, stroma. Please click here to view a larger version of this figure. Figure 4: Immunocytochemical staining of primary limbal epithelial cultures for a putative LESC marker K15. Top row, normal culture; most cells show strong staining for K15. Bottom row, diabetic culture; most cells only show weak staining. The right panels are presented with DAPI nuclear counterstaining. Normal and diabetic cells were photographed with the same exposure time. Bar = 20 µm. Please click here to view a larger version of this figure. Figure 5: The level of GFP-expression in transduced limbal epithelial cells depends on MOI of AV-GFP: (a) 30 pfu/cell; (b) 120 pfu/cell; (c) 300 pfu/cell at 3 days of transduction. Photographs of live cells are shown. Bar = 300 µm. Please click here to view a larger version of this figure. 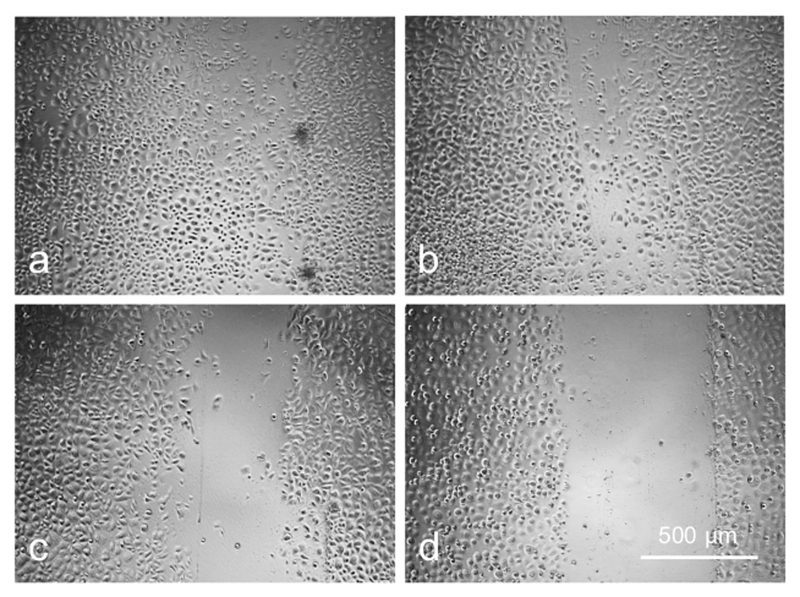 Figure 6: Cell migration is adversely affected by increasing concentration of AV as revealed by scratch wound test: (a) control; (b) 20 pfu/cell; (c) 80 pfu/cell; (d) 120 pfu/cell. Photographs of live cells are shown. Bar = 500 µm. Please click here to view a larger version of this figure. Figure 7: Limbal epithelial cells transduced with AV-GFP at 30 pfu/cell. (a) control; (b) poly-L-lysine; (c, d) transduction reagent; 5 days of transduction. Transduction reagent caused a significant cytotoxic effect leading to cell rounding and death (d, phase contrast). Photographs of live cells are shown. Bar = 400 µm. Please click here to view a larger version of this figure. The cornea appears to be an ideal tissue for gene therapy due to its surface location where the gene delivery, as well as the evaluation of efficacy and side effects, are easy. However, a clinical translation of this powerful approach is still slow due to scarce information on genetic causes of the corneal diseases and the gene therapy targets24. Diabetic complications including corneal alterations may be largely epigenetic in nature, which translates into metabolic memory9. For this reason, the diabetic tissues and cells preserve their abnormalities ex vivo and may be studied in the organ and tissue culture. Also, diabetes causes specific changes in the gene expression levels and patterns that may be corrected by the gene therapy. We have identified several markers altered in the diabetic corneal epithelium including the stem cell compartment5,6,8, and used the human corneal organ cultures7,8 to normalize by gene therapy the marker expression and epithelial wound healing compromised in the diabetic cornea. We have chosen the AV as the gene delivery vehicle because of its strong transgene expression, its non-integrating nature, and its selectivity for epithelial cells, which are qualities superior to those of the adeno-associated virus (AAV)25. The AV transduction of the corneal organ cultures has several critical steps. The corneas should be delivered to the laboratory within 48 hr postmortem, to minimize the loss of epithelium that occurs during storage. To increase the viral uptake, it is important to add caveolae transport boosters, such as sildenafil, during transduction21. When validating the transduction effect on protein expression, the use of several markers is recommended (Figure 3), as specific stem cell markers are not definitively identified. When making the epithelial wounds, there is a necessity to use the chemical debridement due to the fragility of the diabetic epithelial basement membrane resulting in its detachment during manual scraping. A careful daily monitoring of the healing process is needed with objective criteria of healing, such as the disappearance of dead subepithelial keratocytes from view when the epithelium regrows over them (Figure 2). Finally, due to some AV and/or GFP toxicity to the primary limbal cells, it is important to lower the viral dose, at the same time using non-toxic transduction boosters, such as polycations, to ensure efficient and safe transduction (Figures 5-7). The gene therapy system may be modified to use the animal organ-cultured corneas. They are much cheaper than human, may be obtained in quantities on a regular base, and may be suitable for screening, e.g., of wound healing-modulating drugs. However, the human corneas offer potentially broader possibilities for the study due to the abundance of reagents, especially antibodies. In case of the drug screening in non-diabetic animal corneas, the debridement may be done mechanically. If an antibody for a certain marker does not work well in some human corneas, it may be due to the individual variability and/or disease duration or severity. In this case, examining other markers may be recommended. The ability of n-heptanol to remove the cells may significantly decrease over time, possibly due to the oxidation during storage. If this happens, a new, previously unopened, vial may need to be used. If working with the expensive human corneas, a second round of debridement may be attempted. Sildenafil has a short half-life in aqueous solutions; therefore, it must be freshly prepared each time a corneal transduction is performed. The success of culturing limbal cells may depend upon the donor's age; the cells from younger donors usually grow better. A single gene therapy agent may not elicit a significant effect; in this case, a combination of such agents may be optimal17. If the primary corneal cells show signs of toxicity, it is important to lower the viral and polycation (e.g., poly-L-lysine) doses to minimize toxic effect while preserving efficient transduction. Although diabetic organ cultures reproduce many signs of the disease and altered gene expression, they are denervated and lack the supply of immune cells, which may affect the wound healing and stem cells. In this respect, the animal models may offer some advantages, although the animals do not reproduce the full spectrum of human disease signs. The other gene therapy targets exist that efficiently normalize diabetic corneas. An example of such targets may be microRNA, specifically, mir-146a or mir-42423. The combinations of the used target gene modifications with the inhibition of specific microRNA may potentially produce a more potent beneficial effect. Another limitation includes the necessity of relatively long incubation of the cornea with the topically administered AV (e.g., in the form of eye drops) in order to ensure maximum viral uptake. This may pose a problem in the clinic, although taping the eyelids could aid in prolonging the incubation. The use of low concentration of sildenafil in the viral solution could accelerate the AV uptake. The AV transduction effect is transient, which may limit the curative potential of the AV-based gene therapy. Although it lasts long enough to correct the diabetic wound healing slowdown, sustained normalization of the epithelial stem cells might require a longer lasting effect, such as provided by the AAV-based gene therapy24. It should be mentioned that immunogenicity was a serious drawback of early AV vectors. However, the new-generation recombinant AV including "gutless" viruses are largely free of this side effect, increasing their prospects of being potent translational gene therapy vehicles26. Small molecule modulators of various pathways that may be important for wound healing16,17,21, 27-30 are used in the experimental models and the clinic. However, they are not targeted to a specific cell type, may have different effects in different cells, and may act only on some aspects of the diabetic corneal disease31,32. The gene therapy offers a possibility to change the gene expression in a desired direction in specific cells, which we accomplished in this work transducing the epithelial cells using both gene overexpression (c-met) and silencing (MMP-10 and cathepsin F). This approach also allows modulating the expression of specific disease marker genes, one by one or in combinations5,6. Our experiments showed that even in case of combination of three AVs harboring different gene expression modulators, all three genes were affected as expected, and the treatment was more efficient than when each AV was used alone17. In severe diabetic keratopathy with persistent epithelial defects or incomplete epithelial healing upon vitrectomy or laser photocoagulation, a replacement of dysfunctional limbal stem cells may be an alternative to gene therapy. In these cases, cultured and expanded limbal epithelial cells upon gene therapy in vitro may be transplanted on the diseased corneas. Our data show that cultured limbal cells from the diabetic corneas show similar differences in stem cell marker expression as ex vivo corneas making them good targets for the gene therapy. However, this treatment needs to be optimized, due to the high sensitivity of such cells to the viral load and transfection reagent used. We were able to show that the cationic transfection reagents ensured efficient and safe delivery with high expression of a gene of interest in the cultured diabetic corneal epithelium. These results may pave the way for successful gene therapy of in vitro expanded LESC for the future transplantation purposes in cases of severe diabetic keratopathy. Because hereditary and acquired LESC deficiency is also associated with the reduction of corneal nerves similar to diabetes33,34, the transplantation of healthy LESC-enriched cultures onto the diseased corneas could potentially alleviate the diabetic corneal neuropathy as well. The authors declare no financial interests. We gratefully acknowledge financial support by NIH/NEI R01 EY13431 (AVL), CTSI grant UL 1RR033176 (AVL), and grants from the Regenerative Medicine Institute, Cedars-Cedars Medical Center. Bikbova, G., Oshitari, T., Tawada, A., Yamamoto, S. Corneal changes in diabetes mellitus. Curr Diabetes Rev. 8, (4), 294-302 (2012). Calvo-Maroto, A. M., Perez-Cambrodí, R. J., Albarán-Diego, C., Pons, A., Cerviño, A. Optical quality of the diabetic eye: a review. Eye (Lond). 28, (11), 1271-1280 (2014). Tripathy, K., Chawla, R., Sharma, Y. R., Venkatesh, P., Vohra, R. Corneal changes in diabetes mellitus. DOS Times. 20, (5), 55-58 (2015). Ljubimov, A. V., Saghizadeh, M. Progress in corneal wound healing. Prog Retin Eye Res. 49, 17-45 (2015). Saghizadeh, M., et al. Overexpression of matrix metalloproteinase-10 and matrix metalloproteinase-3 in human diabetic corneas: a possible mechanism of basement membrane and integrin alterations. Am J Pathol. 158, (2), 723-734 (2001). Saghizadeh, M., et al. Proteinase and growth factor alterations revealed by gene microarray analysis of human diabetic corneas. Invest Ophthalmol Vis Sci. 46, (10), 3604-3615 (2005). Kabosova, A., Kramerov, A. A., Aoki, A. M., Murphy, G., Zieske, J. D., Ljubimov, A. V. Human diabetic corneas preserve wound healing, basement membrane, integrin and MMP-10 differences from normal corneas in organ culture. Exp Eye Res. 77, (2), 211-217 (2003). Saghizadeh, M., et al. Alterations of epithelial stem cell marker patterns in human diabetic corneas and effects of c-met gene therapy. Mol Vis. 17, 2177-2190 (2011). Kowluru, R. A., Kowluru, A., Mishra, M., Kumar, B. Oxidative stress and epigenetic modifications in the pathogenesis of diabetic retinopathy. Prog Retin Eye Res. 48, (Sep), 40-61 (2015). Lehrer, M. S., Sun, T. T., Lavker, R. M. Strategies of epithelial repair: modulation of stem cell and transit amplifying cell proliferation. J Cell Sci. 111, (Pt 19), 2867-2875 (1998). Lu, L., Reinach, P., Kao, W. W. Corneal epithelial wound healing. Exp Biol Med. 226, (7), 653-664 (2001). Rama, P., et al. Limbal stem-cell therapy and long-term corneal regeneration. N Engl J Med. 363, (2), 147-155 (2010). Di Girolamo, N., et al. Tracing the fate of limbal epithelial progenitor cells in the murine cornea. Stem Cells. 48, (1), 203-225 (2014). Amitai-Lange, A., et al. Lineage tracing of stem and progenitor cells of the murine corneal epithelium. Stem Cells. 33, (1), 230-239 (2015). Di Girolamo, N. Moving epithelia: Tracking the fate of mammalian limbal epithelial stem cells. Prog Retin Eye Res. 48, (Sep), 203-225 (2015). Saghizadeh, M., Kramerov, A. A., Yu, F. S., Castro, M. G., Ljubimov, A. V. Normalization of wound healing and diabetic markers in organ cultured human diabetic corneas by adenoviral delivery of c-met gene. Invest Ophthalmol Vis Sci. 51, (4), 1970-1980 (2010). Saghizadeh, M., et al. Enhanced wound healing, kinase and stem cell marker expression in diabetic organ-cultured human corneas upon MMP-10 and cathepsin F gene silencing. Invest Ophthalmol Vis Sci. 54, (13), 8172-8180 (2013). Saghizadeh, M., Dib, C. M., Brunken, W. J., Ljubimov, A. V. Normalization of wound healing and stem cell marker patterns in organ-cultured human diabetic corneas by gene therapy of limbal cells. Exp Eye Res. 129, (Dec), 66-73 (2014). Hatchell, D. L., et al. Damage to the epithelial basement membrane in the corneas of diabetic rabbits. Arch Ophthalmol. 101, (3), 469-471 (1983). Chung, J. H., Kim, W. K., Lee, J. S., Pae, Y. S., Kim, H. J. Effect of topical Na-hyaluronan on hemidesmosome formation in n-heptanol-induced corneal injury. Ophthalmic Res. 30, (2), 96-100 (1998). Saghizadeh, M., et al. Adenovirus-driven overexpression of proteinases in organ-cultured normal human corneas leads to diabetic-like changes. Brain Res Bull. 81, (2-3), 262-272 (2010). Sareen, D., et al. Differentiation of human limbal-derived induced pluripotent stem cells into limbal-like epithelium. Stem Cells Transl Med. 3, (9), 1002-1012 (2014). Funari, V. A., et al. Differentially expressed wound healing-related microRNAs in the human diabetic cornea. PLoS One. 8, (12), e84425 (2013). Mohan, R. R., Rodier, J. T., Sharma, A. Corneal gene therapy: basic science and translational perspective. Ocul Surf. 11, (3), 150-164 (2013). Liu, J., et al. Different tropism of adenoviruses and adeno-associated viruses to corneal cells: implications for corneal gene therapy. Mol Vis. 14, 2087-2096 (2008). Thomas, C. E., Ehrhardt, A., Kay, M. A. Progress and problems with the use of viral vectors for gene therapy. Nat Rev Genet. 4, (5), 346-358 (2003). Sharma, G. D., He, J., Bazan, H. E. P38 and ERK1/2 coordinate cellular migration and proliferation in epithelial wound healing: evidence of cross-talk activation between MAP kinase cascades. J Biol Chem. 278, (24), 21989-21997 (2003). Saika, S., et al. Role of p38 MAP kinase in regulation of cell migration and proliferation in healing corneal epithelium. Invest Ophthalmol Vis Sci. 45, (1), 100-109 (2004). Xu, K. P., Li, Y., Ljubimov, A. V., Yu, F. S. High glucose suppresses epidermal growth factor receptor/phosphatidylinositol 3-kinase/Akt signaling pathway and attenuates corneal epithelial wound healing. Diabetes. 58, (5), 1077-1085 (2009). Xu, K., Yu, F. S. Impaired epithelial wound healing and EGFR signaling pathways in the corneas of diabetic rats. Invest Ophthalmol Vis Sci. 52, (6), 3301-3308 (2011). Takamura, Y., et al. Aldose reductase inhibitor counteracts the enhanced expression of matrix metalloproteinase-10 and improves corneal wound healing in galactose-fed rats. Mol Vis. 19, 2477-2486 (2013). Byun, Y. S., Kang, B., Yoo, Y. S., Joo, C. K. Poly(ADP-ribose) polymerase inhibition improves corneal epithelial innervation and wound healing in diabetic rats. Invest Ophthalmol Vis Sci. 56, (3), 1948-1955 (2015). Deng, S. X., et al. Characterization of limbal stem cell deficiency by in vivo laser scanning confocal microscopy: a microstructural approach. Arch Ophthalmol. 130, (4), 440-445 (2012). Lagali, N., et al. In vivo morphology of the limbal palisades of Vogt correlates with progressive stem cell deficiency in aniridia-related keratopathy. Invest Ophthalmol Vis Sci. 54, (8), 5333-5342 (2013).